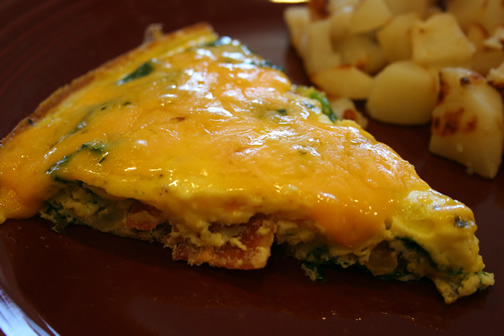 This is a wonderful frittata! It's easy to make, it's filling, and makes a great supper or breakfast! 1. In bowl, whisk bacon crumbles, eggs, milk, salt and pepper. 2. In skillet, sauté onions in 1 tsp olive oil. 3. Once brown, add a few tsp of water and cook another 1-2 minutes. 4. Add spinach and cook over medium heat for 2 minutes, until it wilts. 5. Pour egg mixture over the spinach and onions. 6. Cook over medium heat for 5 minutes, until the eggs have set around the edges. 7. Bake at 450 for 5 minutes.